Top 10 resorts in the West for Scenery, according to SKI's Reader Resort Survey. "Come to Lake Louise for the views. Stay for the skiing. If you arrive on a cold week, you might end up sitting in the lodge all week and looking out the window, to avoid frostbite. But at least the scenery will be top-notch if that happens." "Can I give Telluride a higher score for scenery? Breathtaking!" "Our family learned how to ski at Jackson Hole and now I get to ski there with my grandchildren and their parents. We have the best views in America and the best snow as well." "Sunshine is amazing in so many ways. First and foremost, the scenery is breathtaking. I just love how beautiful the whole area is. Secondly the skiing is great. So many areas to explore. I can&apos;t wait to get back next year for a few days skiing this amazing mountain paradise!" 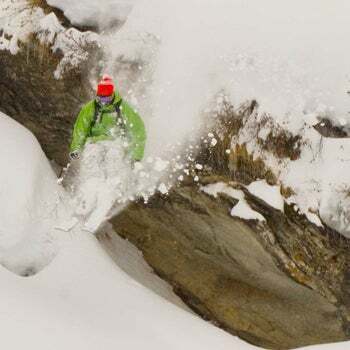 "Targhee is a great resort with the most spectacular views of the American Alps—the Tetons. Great snow." "Heavenly offers up the most beautiful views of Lake Tahoe. Spectacular vistas." "You won&apos;t find better scenery anywhere, you have Glacier Park 30 miles away. The views from the summit of Whitefish Mountain on a clear day are inspiring." "The scenery at Sun Valley is beautiful with 360-degree views from the top. And you simply cannot beat the sun that gave Sun Valley its name." "Taos Ski Area is truly one of the most unique places I&apos;ve been. It&apos;s magical and beautiful. You have to stop skiing at times and take in the scenery." "Views of Big Sky&apos;s Lone Peak are incredible. The tram is worth a ride just for the view on a sunny day, with tons of options for skiing down."